The all-new 2017 Chevy Bolt is in Peoria at Uftring Weston. Whether you're thinking about switching to an electric vehicle or you've been all about them for a while, you have to come see this amazing Chevy Bolt that we have in our Uftring Weston showroom. Not only is it a great car in terms of capability, but it's a contributor to helping the environment. The all-new Chevy Bolt is 100% electric. No gas emissions whatsoever from this vehicle. And with its latest accolade of the 2017 Green Car of the Year, you know it has capability. With 238 miles of range, you don't have to worry about recharging every time you take a trip. And if you're hesitant to drive on the highway, you'll be happy to hear that the Chevy Bolt goes 0-60 mph in just 6.5 seconds. That's lightning fast! 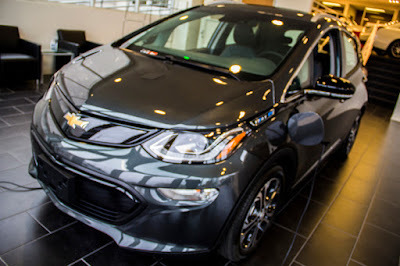 Learn more about the all-new Chevy Bolt in the video below!